October 18, 2012 by Abigail Hirsch, Ph.D.
Wow. 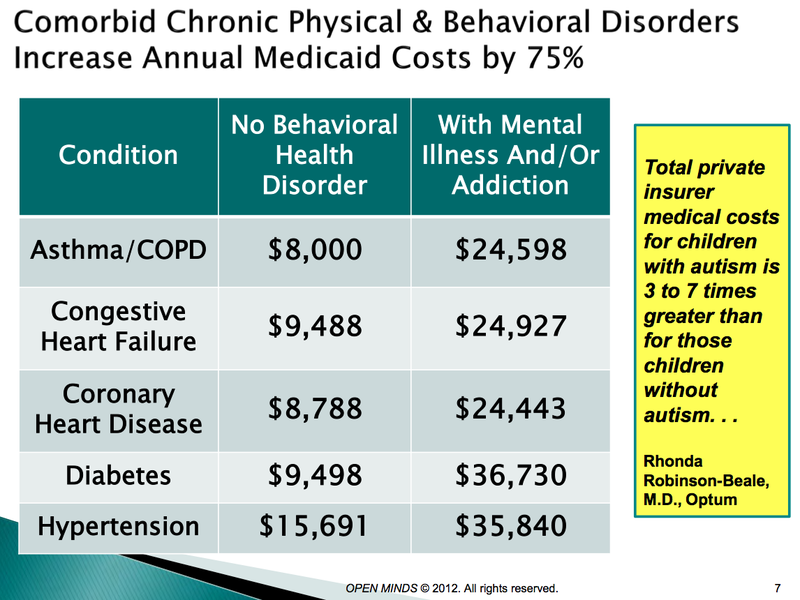 Adding a mental illness on top of a physical illness results in triple the cost to insurance to provide treatment. Plus, odds are pretty good that there is also significantly more lost productivity (read — days of work missed etc) for folks who fall into the second column. So why does this matter? Well, at a policy level it sure seems clear that providing quality and accessible behavioral health care should be a priority to insurers — instead of being a benefit that they nickel and dime both the people they insure and the clinicians accepting their insurance. In addition, to me the data paints a very clear picture of why, even if you have great insurance, therapy is such an important investment. As I was thinking about this data, it seems to me that under the cost figures is the implication that keeping yourself mentally strong, happy, and stable is a very good way to keep yourself out of the doctors office — especially if you are also managing any kind of chronic physical ailment. August 28, 2012 by Abigail Hirsch, Ph.D.
Martin Seligman, the inspiration behind the positive psychology movement, identified 3 thought styles that are intimately connected to how susceptible one is to depression. These are personalization, permanence and pervasiveness. I recently put together this little video clip about personalization. Hope it’s helpful. September 22, 2011 by Abigail Hirsch, Ph.D. So, if my postings have been a bit sporadic the past few months, it’s with good reason. Much to our surprise, after 8 years of unsuccessfully trying to add child #4 to our family, I seem to be very much pregnant (due in March if you’re curious). What’s the connection between that and a flutter of anxiety? Imagine my surprise when, instead of feeling overjoyed with the discovery, I instead promptly had a massive panic attack. Dr. Heitler, my office-mate (and yes, my mother) has a very helpful technique for figuring out what was going on that triggered that anxiety — and where my husband and I needed a pow-wow to get on with being excited about this new development. Dr. Heitler posted a blog this week at PsychologyToday with a very nice description of the process I found so very helpful. The one sentence summary — trace back to find the “butterfly” thought that in some sub-conscious way, triggered the anxiety. Curious what my “butterfly” was? Seeing our camping gear ready for a weekend’s adventure “butterflied” me to concerns that a new baby would mean we would no longer be able to do this kind of family adventure. The solution — lots of fun ideas for how to tote a baby along on family outdoor adventures — and plans for leaving baby-to-be with the Grandparents as well! August 29, 2011 by Abigail Hirsch, Ph.D. Here in Colorado, for the most part, kids are all back to school and for many parents there is finally a bit more space to breath and think about what comes next. Below is a quick Family Mental Health and General Growth and Happiness Checklist (long winded name for a short checklist) I’ve found helpful to use each year as everyone is settling in. For each member of your family, including yourself, ask the following questions. 1) What are a few of this person’s strengths? 2) What activities, hobbies, jobs etc are a regular part of this person’s life and help to bring out their strengths? 3) What things are hardest for this person? What am I most worried about for this person? 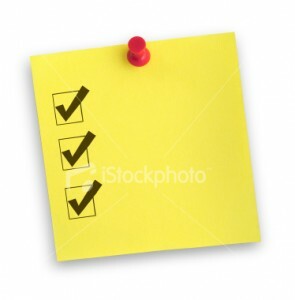 4) What is one thing I can add to my/our regular routine to help with my answers to #3? Who else (teacher, professional counselor, relative, friend) might be helpful with my answer to #3? 5) What little voices do I have about things related to this person? In other words, what are things I’m concerned about and might be tempted to brush aside? 6) How will I know when it’s time to address those “little voice concerns” head on? While it is simple checklist, the impact of taking a few moments to reflect on these can make a HUGE difference for the year. June 29, 2011 by Abigail Hirsch, Ph.D.
I’ve been working with a Mom whose son is being bullied. This poor little boy survived a horrible school year of taunting, teasing and behind-the-adults back general nastiness, only to be so happy to go to summer camp and discover that the bullly was in his group. It’s no fair. No one ever should have to put up with being treated that way. I kept thinking that bullies don’t stop in elementary school — bosses sure can be bullies, so can co-workers. And, far too often it’s one’s spouse who can be a bully. And in all these cases –it’s not ok. So, how does one handle a situation where someone is name calling, taunting, plotting-against, teasing or worse? Here are three Power of Two Principles. 1. Leave a situation that gets too heated. If someone or something is not treating you right, exit. Exit early — no need to stick around for more taunting. Go to a different part of the playground. Help a child find a different bully-free activity. Suddenly develop an urgent need to get some water. And all the more so if it’s your spouse who isn’t sticking to the rules. Help your spouse stop bullying by leaving the situation before it gets unpleasant. (BTW, between adults one can and should then come back to the person/topic to try to address things in a more productive manner). 2. Be better than the bully. That is, be a better person than someone who thinks being nasty is ok. Take the high road. While it may never change them, it will change you. You’ll become a better and stronger person when you handle tough situations with calm, clarity, poise and grace. 3. Be positively proactive. While there’s a time to turn the other cheek, it’s for sure time to get a better plan. Instead of getting blinded by a desire for revenge, look down the road. What can you do to set-up a better situation in the future? How can you learn new tools for calmly standing up for yourself? How can you change the situation to reduce the odds you’ll be facing bullying behaviors? Keep the focus on what can I do. Be very wary of how can I get back at the bully. Want more information on relationship safety? Check this out — http://poweroftwomarriage.com/actions/action/special_topics-safety-dv_flash/. Great Listening is Best for the LISTENER! May 25, 2011 by Abigail Hirsch, Ph.D. I had a wonderful session with a couple today where we talked about the hallmark of truly first rate listening. Here’s what we arrived at. First rate listening transforms THE LISTENER. Yes, it’s wonderful to be listened to and listening is a gift to do for anyone you care about. And, the real halmark of great listening is that every time you really do it well — that is listen to learn from your spouse — it’s a chance to become a more open, more understanding and more educated you. So, next time you’re listening, notice if it’s changing YOU. Want more on how to do this kind of listening? Watch a video of me teaching about listening here. Camp Do it Yourself– Therapy Do it Yourself? May 13, 2011 by Abigail Hirsch, Ph.D. I just got back from a conference. The conference was pretty unremarkable. The article in Southwest airline’s inflight magazine however, was first-rate. Find the article here. Camp Do It Yourself. Here’s the idea. Find a first-rate, energetic, spunky high school or college student. Find a handful of kids your kids like. Put sitter and kids together for a summer of low-key, creativity, informal sports, art theater and lots of relaxed create-your-own-fun. As I was feeling the pressure to add this camp and that activity to the plate for our kids for this summer, I found this article so refreshing. Let summer be summer. A time to move at a slower pace. A time to learn how to entertain oneself instead of to be entertained. A time to lie in a hammock curled up with a book and nowhere to race off too. Now that is a true summer gift for any child. And for us adults too! The article also got me thinking about how easy it is to assume that a professional is the best person when you need help for your kids. Actually, often DIY therapy, tutoring etc also works great. Here’s the basic idea. 1. You, the parent find a professional to coach you and your wonderful high school or college student “coach” about how to work with your kid. Schedule a first meeting with the three of you to create a plan for what your “coach” will do with your child. 2. You watch out of the corner of your eye while your kid and “coach” work together. Take notes to review with your professional. 3. You and the “coach” follow-up with the professional. 4. Repeat as many times as need :)! You save money. Your child gets more services from someone who is likely to be more on their level and way more fun. Your “coach” gets a fabulous learning experience. Everyone wins.